You could not resist to these little cute cakes. 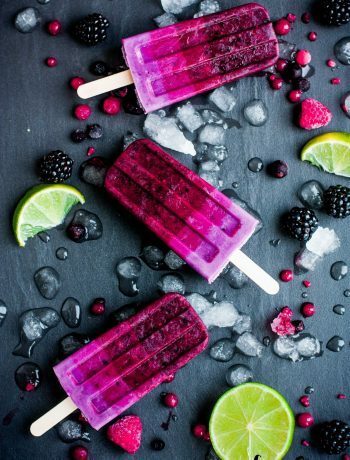 Besides adorable, they are delicious and super easy to prepare. 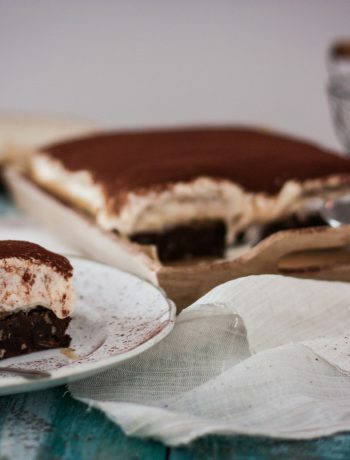 The shells are basically chocolate sponge cake and the filling, in this case, inspired by a Banana Split, is nothing more than a few slices of banana and a bit of whipped cream. Simple, but delicious! 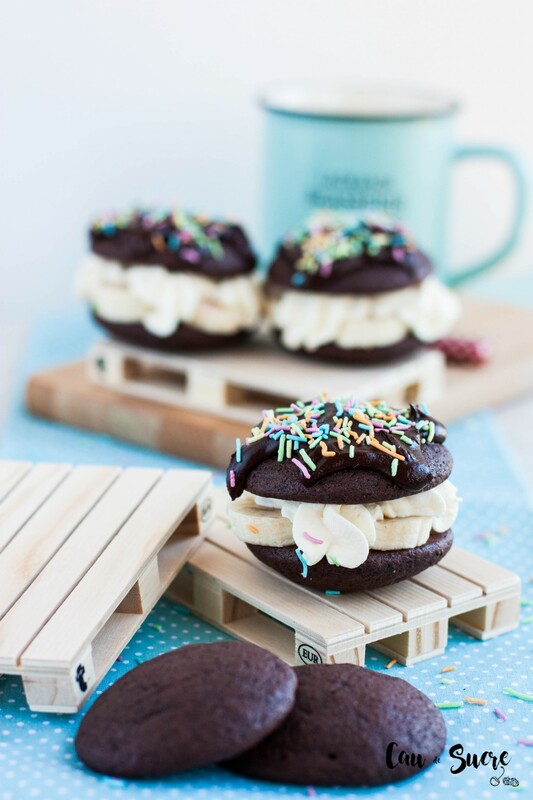 The recipe that I bring you today is going to delight you, it is those easy but succulent and with chocolate 🙂 Whoopie pies, those who are in the world of baking sure you know them, ones who are not will be asking themselves right now How to pronounce the word Whoopie. It does not matter how it is pronounced, you put one in the mouth and however it goes out will be OK, hehehe. 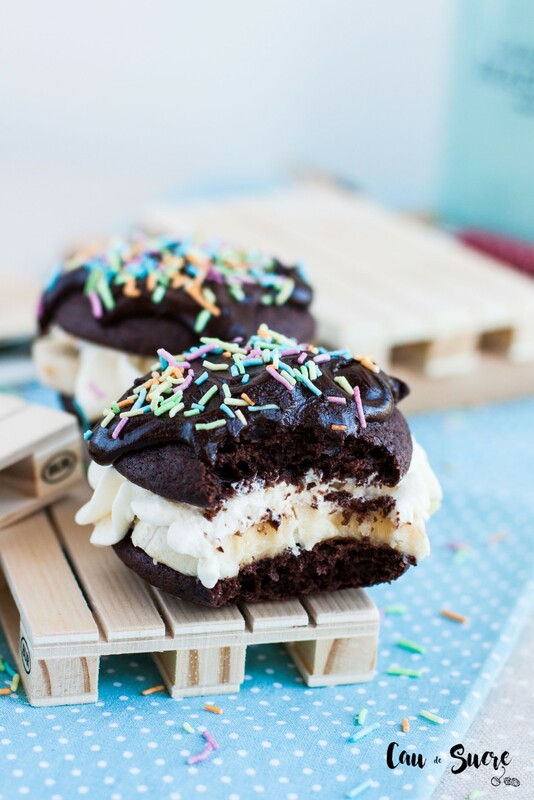 Well, the delicious Whoopies are sweets of origin in the United States that are between a cookie and a sponge cake, although I would rather say it’s a mini-sponge cake sandwich. They can be made of very different flavours and fillings, although I have read that the original Amish made in North America was chocolate. This is a combination that everyone will love, especially children, and if you put some chocolate Ganache on top, as I have done, and a few Sprinkles they would look gorgeous. They can be stuffed with any other cream or fruit, for example, I stuffed some of those ones with strawberries and cream, and well what I’m going to say, they were to die for!!! 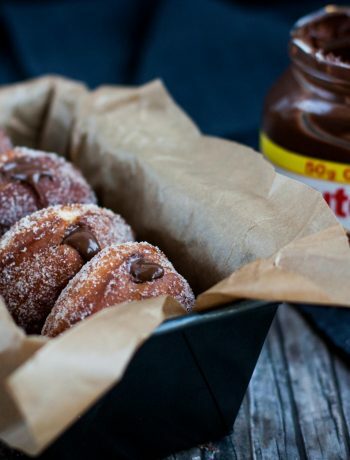 Well here I leave the recipe, experiment with them and try different fillings. You will see that they are super easy, surely you will repeat! Preheat the oven to 200ºC. Whisk the egg, yolk and sugar with the electric mixer and rod attachment at high speed for about 5 minutes, until foamy and the mixture is much whiter. Add the yogurt and beat about 30 seconds more at medium speed. Melt butter in microwave and mix with the milk. In another bowl, sift the flour with the cocoa and baking soda. Pour in the dough half the flour and mix until incorporated. Then pour the milk and butter mixture mixing at low speed for another 30 seconds. Finally pour the rest of the dry ingredients and mix just until they are combined. If you beat too long the dough will be very liquid and the whoopies will not stand the shell shape. Prepare two baking sheets with baking paper. Fill a pastry bag (or a ziploc bag if you do not have piping bag) with the dough. Create circles of dough about 5 cm in diameter on the trays. Be careful to leave enough space between each shell since they grow quite a lot during baking. Bake one of the trays first and then the second for about 10 minutes. 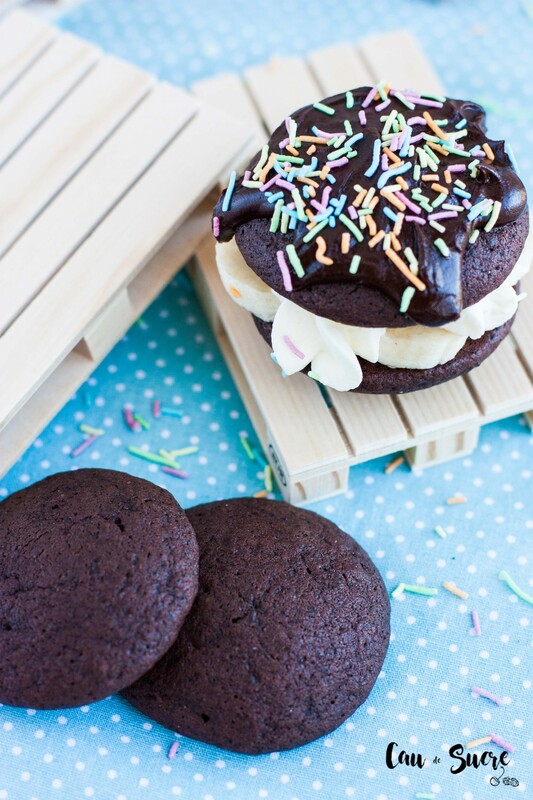 Allow the whoopies to cool for about 2 minutes on the tray and then cover them with a dish towel and allow them to cool for at least 10 minutes. To prepare the filling, cut the bananas into slices, whip the cream with the sugar. 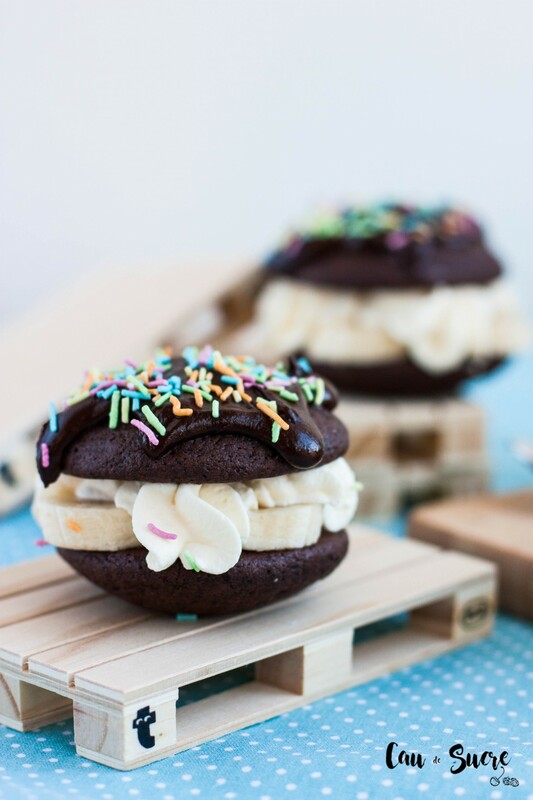 Place 4 or 5 slices of banana in one of the whoopies, cover with a little cream and cover with one of the halves as making a sandwich. If you want to decorate with chocolate, melt the chocolate in the microwave and add the cream. 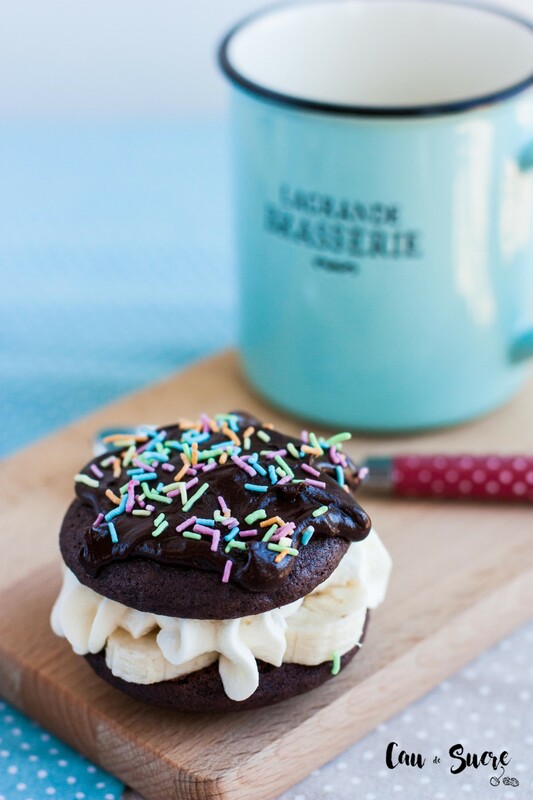 Sprinkle the whoopies with the chocolate and colourful sprinkle. 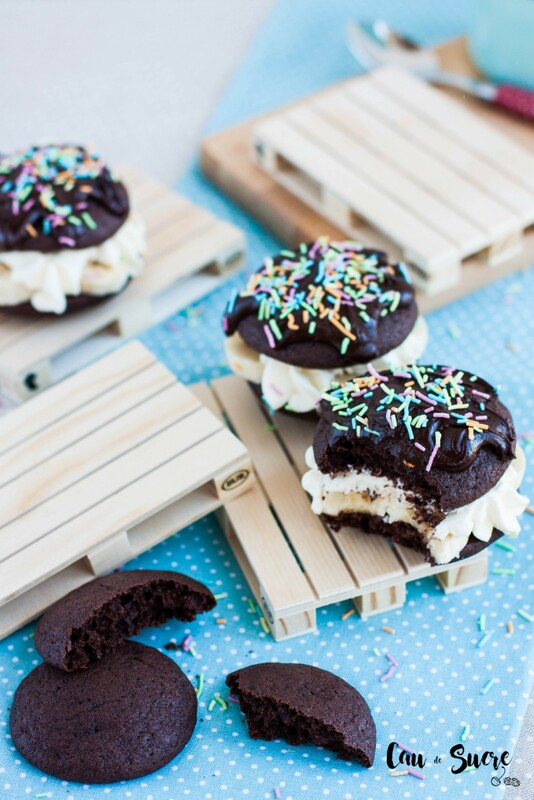 I recommend you to assemble the whoopies just before serving, the cream can not stand too much its shape and you will start to make water if you leave it too long. 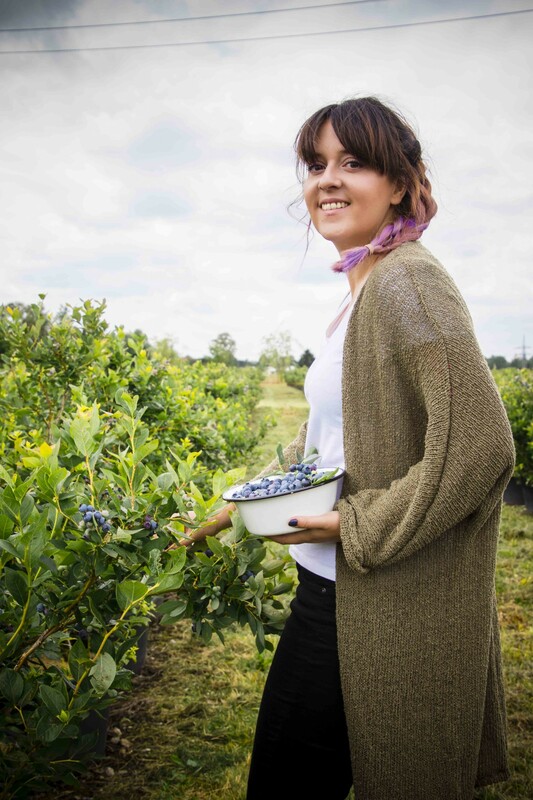 The fruit also oxidizes once cut, so better not keep them assembled. Shells can be kept in a sealed container for several days.